The Arroyo Seco Confluence is a complicated site in which freeways, rail infrastructure and the rivers are tightly intertwined. What’s more, the Confluence is a very important site with immense potential. 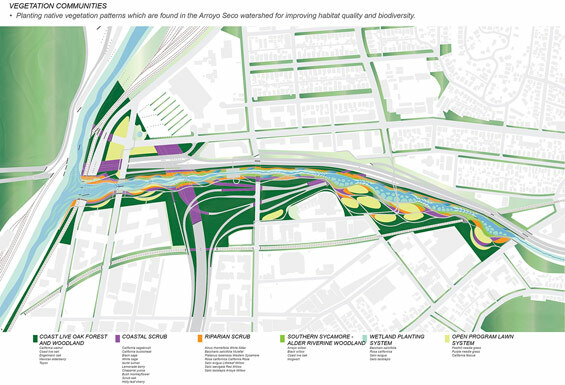 The objectives of this study are to re-transform the Arroyo Seco from a channelized and single-functional channel to a multi-functional corridor of significant natural and cultural value, to provide safe access and create activities and recreation for people within the maze of pre-existing infrastructure, to regenerate for developing to bring new life and investment to nearby urban settlements. 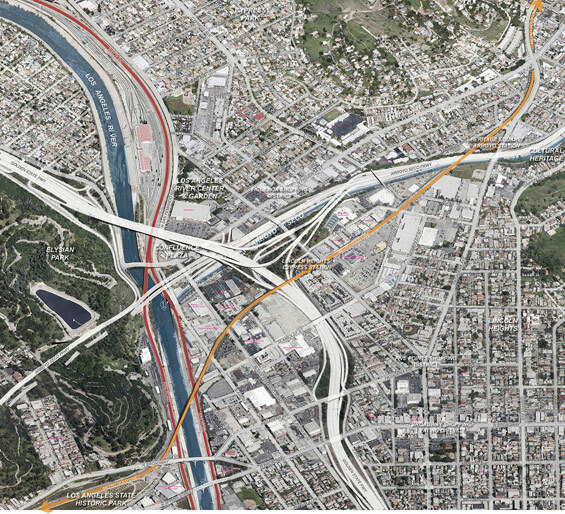 The confluence of Arroyo Seco and the Los Angeles River, located in northeast Chinatown, is a complicated site in which freeways, rail infrastructure and the rivers are tightly intertwined. What is more, the Los Angeles River and the Arroyo Seco have been channelized by concrete, freeways and rail infrastructure predominate much of the area. The Metro Gold Line provides frequent access to downtown Los Angeles, the many communities located in the northeastern sections of Los Angeles, and the cities of South Pasadena and Pasadena. The railroads, freeways and electrical transmission lines are visual and physical obstacles to the future revitalization of the Arroyo Seco Confluence. Furthermore, freeways, railways and industrial physical structures create obstacles to pedestrian and bicycle modes of travel. However, the Arroyo Seco Confluence is a very important site with immense potential: unparalleled opportunity for habitat and stream restoration; key spot for flood management and water quality improvements; easy access to touch the river; gateway to the river through Downtown; historical, cultural, environmental and hydrologic importance. 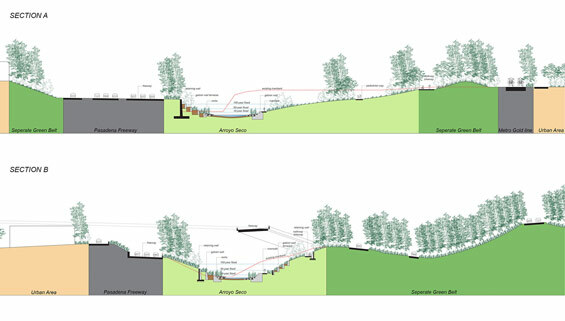 Basing on the above, the most important objective of this study is to transform the Arroyo Seco from a channelized and single-functional channel to a multi-functional corridor of significant natural and cultural value. Secondly, it is to provide safe access and create activities for recreation within the maze of pre-existing infrastructure. 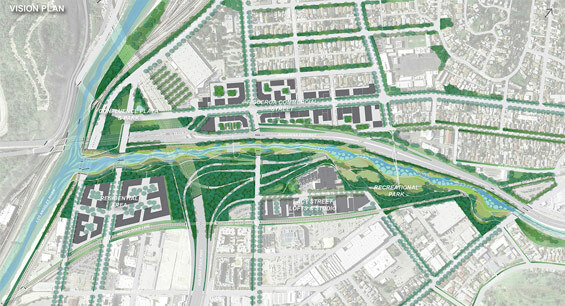 Thirdly, it is to create a synergy that elevates an urban riverfront landscape to a thriving and harmonious balance of complex systems where modern infrastructure meets natural ecology. 1. 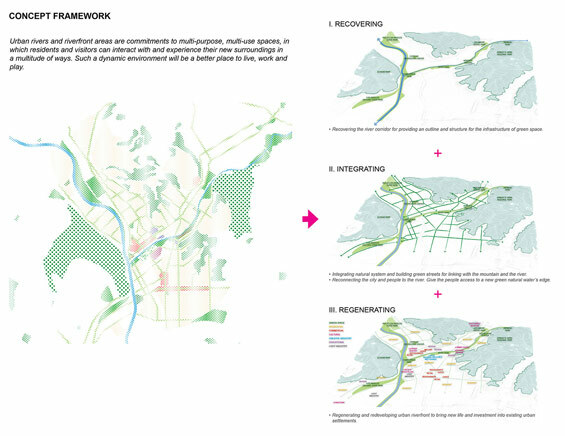 Recovering the river corridor for providing an outline and structure for the infrastructure of green space. 2. Integrating natural system and building green streets for linking with the mountain and the river, and reconnecting the city and people to the river. Give the people access to a new green natural water’s edge. 3. Regenerating for developing to bring new life and investment to nearby urban settlements. 1. Widen and deepen the channel for expanding floodplain and increasing flood capacity. 2. Introduce new landscape elements for water quality, such as terraced remediation wetland and wetland treatment system. 3. Plant native vegetation communities for habitat and biodiversity. 4. Create pedestrian and bikeway system for providing access for people, and provide different open spaces along the river. 5. Redesign sidewalks along streets and use vegetated bioswale for capturing, storing and cleaning stormwater before it flows into urban sewer pipes and rivers. 6. 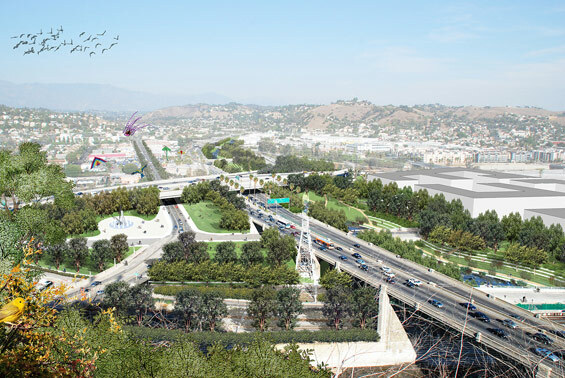 Redevelop urban riverfront area and Improve public transit and bikeway system for connecting the historic site from Downtown Los Angeles to Pasadena. 7. Provide interesting and continuous tour route for residents and visitors. 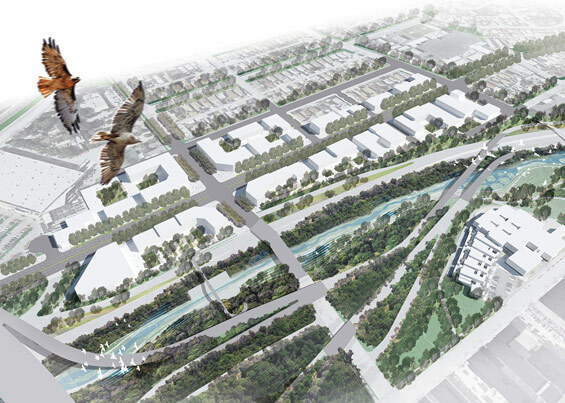 Finally, the Arroyo Seco Confluence is commitment to multi-purpose, multi-use space, in which residents and visitors can interact with and experience their new surroundings in a multitude of ways. Such a dynamic environment will be a better place to live, work and play. 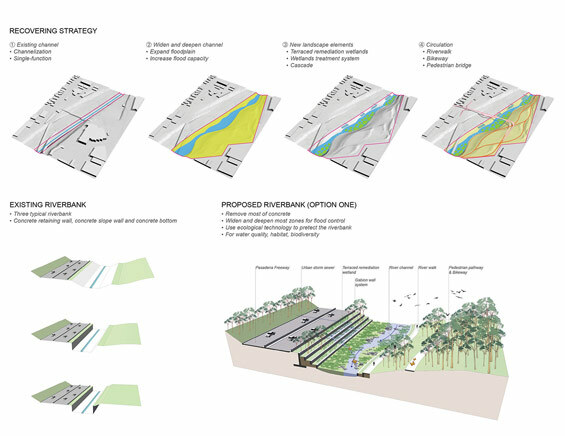 This project won 2013 ASLA Student Analysis and Planning Category Honor Award.